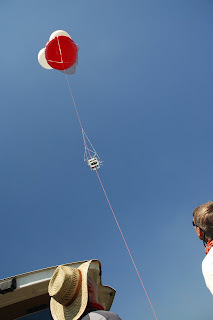 We had remarkably good luck with the blimp and camera system down in Guatemala. Ultimately, we had to get a tank of hydrogen and add additional balloons to the top of the blimp to keep everything afloat (we used a heavy camera), but the results we got were quite excellent. This photo at the urban center of Bilbao is particularly good (though a little blurry at the highest resolution). 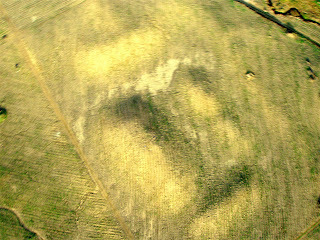 With shadows late in the day, it shows the giant rectangular mounds that comprise the deposit. Note that the scale of this photos is about 300 meters across.